1. 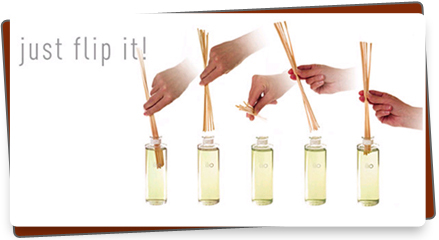 Place the sticks that came with your reed diffuser into the bottle to absorb the diffuser oil . 2. Flip sticks so that the "dry" side of the sticks is now closest to the bottle and the saturated end is in the air. 3. Place unsaturated (dry) end of the sticks into the bottle. 4. Let your reed diffuser naturally permeate your space. Reed diffusers will continue to evaporate into the air, creating a subtle and luxurious scent. To refresh the fragrance of the reed diffuser, simply repeat steps 2-4. If you want to increase the scent, just flip the sticks. Please remember to always flip diffuser reed sticks over a paper towel and to wipe bottle so no oil drips onto your table/surface. In small spaces, like bathrooms, use less sticks. We find 4 (of 10) diffuser sticks work well when using lemon diffusers in our office bathrooms. If we use all the sticks, it can be overwhelming in small spaces. Did you know fire codes for offices, apartments, dorms etc. make candles illegal to use? Our customers enjoy legally using reed diffusers in restricted places where candles are not allowed. Reed diffusers are a great way to enhance the smell of a room without an open flame. In fact, diffuser essential oils are flammable so keep away from open flames. Just like a glass of ice water can leave a ring on a wood table, reed diffusers work best when placed on a drink coaster (ceramic, glass, etc.) or glass table. Please use care when placing on wooden surfaces because the essential oils can leave marks. Diffusers are meant to stand up and to be left untouched. If kids are around diffusers, please keep the diffusers higher and out of reach. Spilled diffusers can damage table surfaces. Diffuser oils should not be ingested. Thank you for protecting your furniture and children from possibly harmful Diffuser oils . - Diffuser essential oils are flammable, do not light and keep away from open flame. - Do not ingest essential oils - Diffusers contain essential oils and will stain wood surfaces. Always wipe clean the bottom of your bottle before setting on any surface. What are reed diffusers and how do they work ? Are your reeds bamboo or rattan ? Can I re-use my reeds ? How much of the diffuser oil do I put into my glass bottle ? Can I dilute the oil with water ? How often should I flip the reeds ? How often should I replace the reeds ? What should I do if the bottle is not empty but the scent doesn't seem to be diffusing ? How many reeds should I put in my bottle ? Where should I position my new reed diffuser? My reed diffuser is too strong. Is there anything I can do? 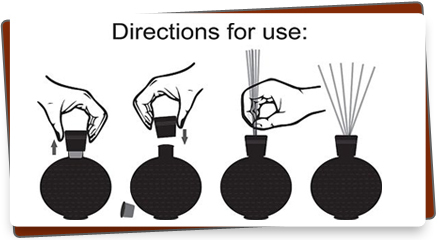 What are the safety recommendations for reed diffusers ? Reed diffusers are the hottest trend right now in home fragrancing.Rattan reeds are inserted into a glass bottle , or glass jar or ceramic pot of scented diffuser oil. Unlike candles, reed diffusers are flame free and do not require any heat. They disperse scent into the air naturally. No flame means no soot and more importantly, no risk of fire ! This makes reed diffusers safer for your home, office, classroom, etc. Our reeds are premium quality RATTAN reeds. There is a lot of misinformation on the web about reeds. Reeds are not bamboo. Perhaps people confuse rattan reeds with bamboo as rattan reeds look somewhat similar to bamboo skewers. However, bamboo reeds or chutes would not work as they do not contain the channels for the oils to wick (travel) up. Bamboo contains "nodes" which block liquid from wicking (traveling) up and scenting the air. No. Once reeds have been used for a certain scent, you cannot use them for another scent. The scent that is already absorbed into your reeds will mix with the new scent and could produce undesirable scent combinations. You should use new reeds when you switch to a new scent, if the reeds become completely saturated, or if they become clogged with dust. After prolonged use and complete saturation of the reeds, the channels can become slightly clogged. Simply replace with new reeds to get the scent rolling again ! Some suggest halfway and others suggest 3/4 full. We suggest filling your glass bottle 3/4 of the way full. That's how we have them in our own houses. No. Oil and water do not mix. You'll end up with warped reeds and uneven wicking. Our reed diffuser oils are specially blended for easy wicking. There is no need to mix them or dilute them with anything.. Whenever you notice the scent fading a bit or want an extra burst of fragrance.You should flip the reeds about once per week. Replace the reeds after they permanently stop diffusing. Over time, reeds can become clogged with dust. Before replacing, flip them. This usually starts the scenting process all over again. If this doesn't work, your reeds are probably clogged with dust or overly saturated and in need of replacement. Flip the reeds over in the bottle exposing the "wet" ends to the air. This simple repositioning will help to kick-start the diffusion process. Don't flip too often, however the more often you flip your reeds the faster the oil will dissipate. Sometimes the reeds are completely saturated with oil and over time, they can become clogged. If you still have oil in the bottle and flipping the reeds doesn't seem to help , then simply replace them with new reeds. It is a matter of preference really. More reeds diffuse more scent. We usually put between 6 and 10 reeds in a bottle. Positioning your reed diffuser near a source of airflow, such as a vent or a window, will help the fragrance spread faster throughout the room. The downside is that this will also decrease the life span of your reed diffuser as oil dissipates at a faster rate. Try placing your reed diffuser away from air conditioning or vents first and see if the scent is sufficient for your own personal tastes. If you find that the fragrance emitted by your reed diffuser is too strong, simply remove some of the reeds. The less reeds you have in the bottle the slower the oil will dissipate throughout the room and the less potent it will be. As the formula is designed for optimal wicking action, we do not recommend adding anything to the oil itself. Do not ingest oils. Use caution when filling your bottles with oil or flipping your reeds as oils can damage some surfaces. Do not light reeds. Be careful not to tip over the diffuser. Use caution when utilizing diffusers around small children and/or pets.